1959-60 Parkhurst Hockey marked the third straight year the company went with a 50-card set featuring the members of only two teams. This time, they went with a tweaked design. The checklist even featured executives for the first time. The backs were typical, however, featuring a fairly lengthy paragraph about each player. The player picture on the front is superimposed, as it is for all of Parkhurst's base sets after 1956. Instead of just solid white, a colored element that resembles a red, blue or yellow hockey stick was also placed in the background. A team logo appears in one of the upper corners. The player's name is printed underneath his image. A circle with the card number is on the opposite side of the logo and the player's position runs under that. Backs follow the same format as the two previous sets but are in two colors. The player's name appears at the top in red ink. Two lines of vital stats and the previous season's record follow in black ink, along with a biography in English. A send-in offer appears in red, followed by a French translation of the biography in black. A French version of the send-in offer appears in red ink at the bottom. Only players from the Montreal Canadiens and Toronto Maple Leafs are included in 1959-60 Parkhurst Hockey. The set has three action cards. Coaches from both teams and several executives are shown as well. Among the top-level men are Hall of Fame member Punch Imlach. 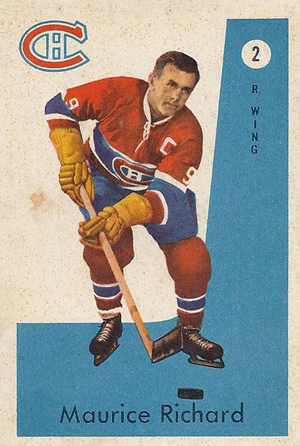 Imlach's card is considered to be a rookie card. The other key rookie in the set is Carl Brewer.